There is more to Greek wine than Retsina and Domestica. The Greeks have been making wine longer than anyone and until recently they have been keeping it for themselves. The economic crisis has changed this and suddenly Greek wines are earning the international respect they deserve. I am a wine drinker. 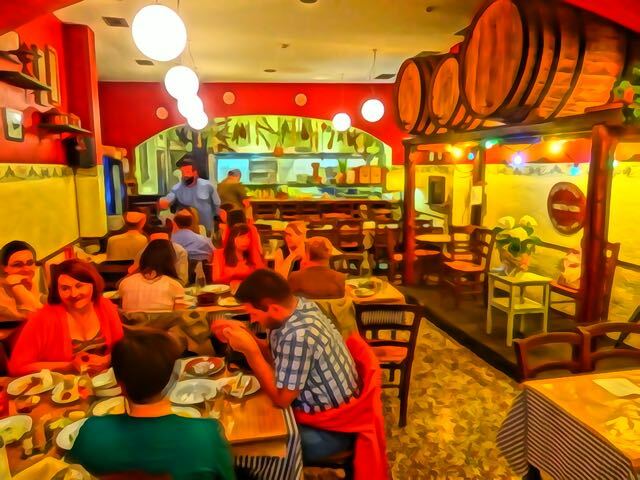 My favorite earthly activity is eating in a taverna with my friends and drinking wine, especially Greek wine, whether it is from the bottle, barrel or the box. Some of my favorite tavernas have their own wine, straight out of the barrels, which are usually stacked against the wall. We order it by the kilo and we can go through several kilos in an evening. Glasses are continually being refilled by each other without anything being said. It's like a reflex or second nature to fill your neighbors glass when you see it is empty. And when the carafe is empty someone at the table just lifts it in the air and catches the eye of a waiter, the busboy or even the owner of the restaurant and in thirty seconds it is full again. Retsina used to be my preferred wine and once in awhile if you are lucky, that is what is available in those barrels. But many tavernas these days have turned away from retsina and are making excellent wines, often as good or better than any well known commercial bottled brands, (though you can find yourself in a taverna where the barrel wine is awful). Most restaurants are proud of their wine though not all the restaurants make their own. Some buy it from distillers by the barrel or by large jug, and in some touristy restaurants homemade wine, or hima, as it is called, is not even available and you have to take your chances with the wine list. Lately many restaurants have been buying bulk wine in boxes and filling the carafes from them. But before you get upset I want to reassure you that many of these boxed wines are pretty good and in some cases it is the same bulk wine the restaurants have always had, but now it comes in boxes. But walking into a restaurant and seeing barrels stacked is often a sign that they make their own wine and you should try that first before you try any bottled wine they may have. My rule is to always ask for local wine (doh-pio) and then ask for hee-ma or wine in a carafe (kara-faki) and hope for the best. It is rare that I will get a house wine so bad that I send it back and order a bottle from the wine list, but it does happen. I always ask if it's good (ee-neh kalo?) and they always say absolutely (veh-vay-os). But what else are they gonna say? It's terrible? 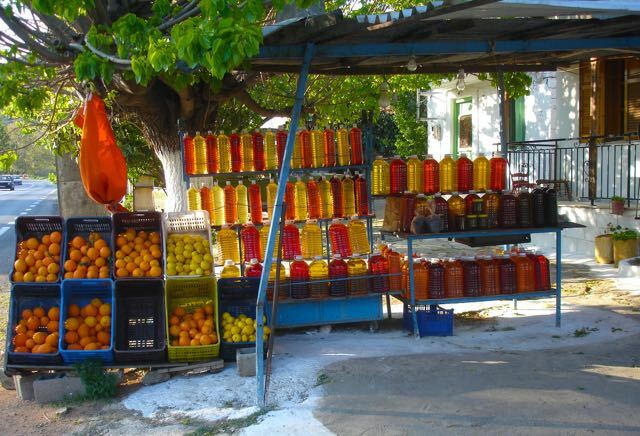 There are also many farmers on the islands who are bottling their own wine and you can often find them in tavernas and in the various traditional shops, supermarkets and even in the bakery. By the way you can order most of these wines through Greece and Grapes which has the largest selection of wine I have found and can ship just about anywhere in the world. There have been many explanations as to why retsina tastes the way it does. The explanation is because they put pine resin in it to make it taste like that and the reason is because they like the taste. Some people have come up with theories on how this all began. According to Vassilis Kourtakis, who makes the most popular of the bottled retsina, the ancient Greeks knew that the air was the enemy of wine and used pine resin to seal the tops of the amphora and even added it to the wine itself. When we were teenagers we were told that during the Second World War, the Greeks put resin in the good wines so the Germans who occupied the country would not like it. That was nonsense. Then as we became more wise we came up with the theory that since there were mostly pine trees in Greece they stored the wine in pine barrels and so it tasted like pine resin and rather than figure out how to get rid of the taste they decided it was easier just to learn to like it. That is a little more reasonable an explanation but probably not accurate. Yiannis Yannarakis (photo), my brilliant computer nerd friend, finally gave me a believable explanation for why the Greeks drink retsina and why they became ashamed of it. Yiannis said that the resin was put into the wine as a preservative in small amounts. But if the wine was bad they would put in larger amounts to mask the taste and gradually the Greeks began to like it as did many of the early tourists. They would also preserve with sugar and that is where you get Mavrodaphne and the sweet wines from Samos. But visitors always poked fun at retsina, saying things like it "tastes like turpentine but not as good" and things like that, which probably gave the Greeks a complex about it. Eventually as wine making methods in Greece improved everyone was making good wine and some people were making excellent wine. 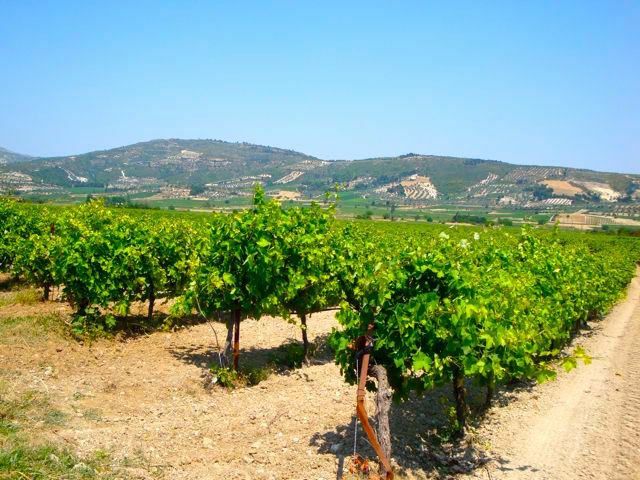 Retsina was looked down upon as being more working class, a sort of embarrassment to the world of wine. 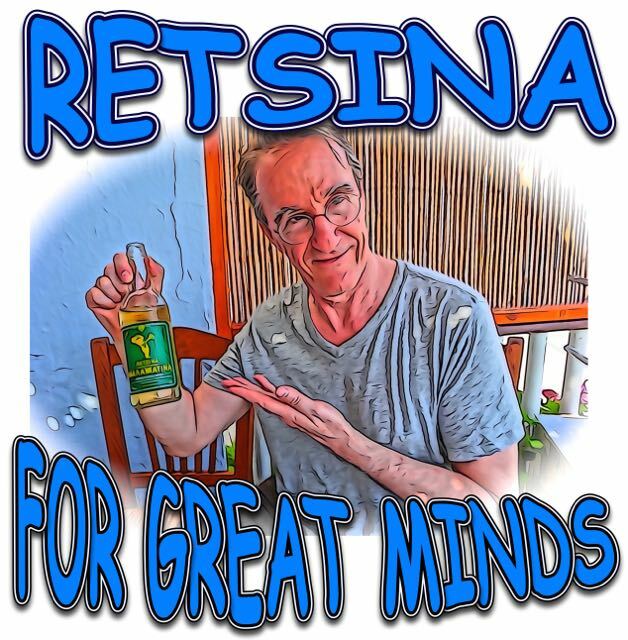 But I know poets and visionaries who have always loved retsina, even bad retsina, and their taste is being vindicated because it is making a comeback. In a way the same thing happened with ouzo which about ten years ago became fashionable and we saw the change from screwcap to corked bottles, with brands like Plomari and Mini. Watch for the same thing to happen with retsina. Right now you can get retsina in beer bottles, and plastic water bottles as well as the normal wine bottles, but Kexrimpari comes in a Mateuse type bottle and that is a sure sign that Retsina is on its way back. The reason Retsina is so well known outside of Greece is because it was the regional wine of Attika and so it was the wine of Athens. When travelers came to Greece this is what the locals were drinking and so it was the wine that people talked about or brought back with them and so the whole country of Greece became associated with retsina for better or worse. As far back as the late 1800's Athens had over 6000 tavernas, all filled with wine barrels. The grapes were pressed in the countryside and then brought into the city by horse-drawn carts, before the fermentation had taken place and then taken to the restaurants where the proprietor poured in the resin and decided when the wine was ready. It was not until the 1960's that bottled retsina became available in the countryside and common in the city as many of the old tavernas disappeared and land for cultivating wine near Athens became scarce. 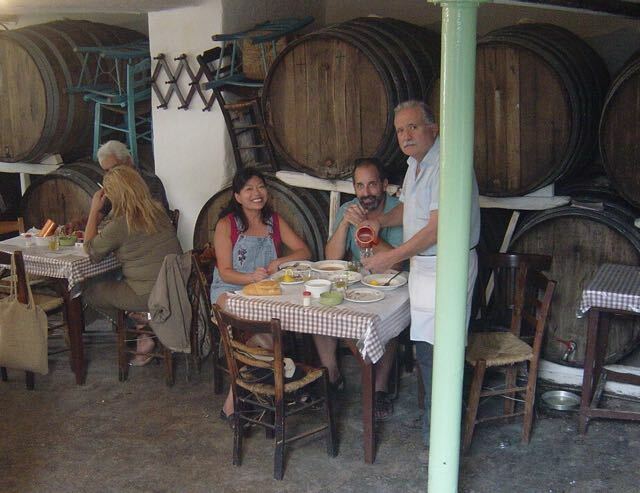 If you want to get a feeling for the way Athens was in the sixties and even drink some pretty good retsina you can go to Oinopoulion Taverna in Psiri (photo) which is owned by the Markos Winery of Attika. It has a great atmosphere and some excellent wines from the 'barrel' and bottled, as well as live rembetika music in an historic taverna. You can buy their Shinopefko Retsina and some of their other delcious wines through Greece and Grapes. Nowadays retsina from the barrel is hit or miss. In fact they may call it retsina even if it is just the local barrel wine. But if you go to a taverna and it is full of happy Greek people drinking from glasses that are being refilled over and over again from a carafe then chances are the retsina (or whatever) is pretty good. When it's not, mix it with soda water like I do. This also will enable you to drink all night long. One of the things I have noticed is that I can drink a lot of retsina and still not be hung over the next day. My kidneys may hurt like hell but otherwise I feel great, considering. As for where you can get good retsina from the barrel, this is a question I am asked fairly often especially by people who lived in Greece in the sixties and came back 50 years later and wonder where all the retsina went. 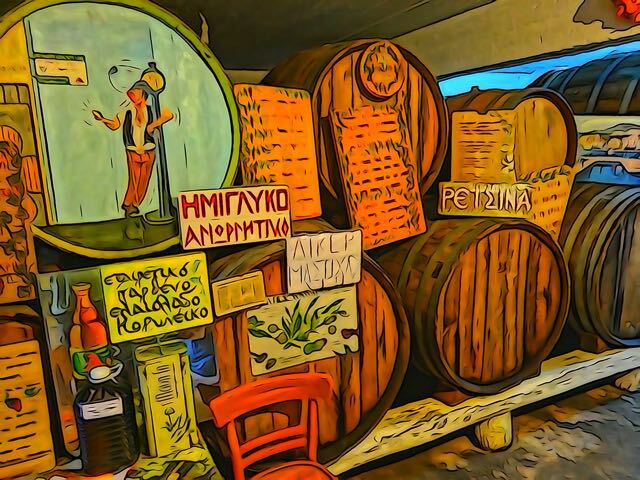 Most neighborhoods will have a kava (wine and spirit shop) and there will be wine from the barrel and probably retsina and you can taste it before you buy. In my neighborhood of Kypseli there is a basement kava called H Pigi Tou Dionysiou (photo) on a small street called Xanthis near the intersection with Lelas Karagiani a block or so north of Fokionos Negri and he has very good retsina in the barrel. My current favorite bottled retsina is called Repsene, which comes from Iraklion, Crete and is sold in plastic water bottles at my local bakaliko. I have been drinking it every night since I came to Kea and even if I open a bottle of my favorite wines I end up going back to the retsina. Maybe it has ruined my subtle taste buds. I don't care. I wake up feeling fine and it tastes good with everything I have eaten. Rolando is thinking about carrying it in his restaurant and one day I saw Yannis buy two bottles for his taverna next door. When I was in Athens with Pandelis Melissinos we discovered a retsina called Kexrimpari, from Thessaloniki, which was similar in taste. Their Tears of the Pine is considered one of the best retsinas. One Saturday night though we went to Yiannis taverna because he roasted a whole pig and we drank the popular bottled retsina called Malamatina which we can get in the USA and for most people is the only retsina they ever tasted (along with Kourtaki) and it did not taste anywhere near as good as the other two labels. Karela Retsina comes from Patras and was sold in the USA in 4-liter bottles wrapped in a basket and more recently I have seen it in bottles. I don't know if you can find it where you live or in Greece but I have seen it advertised in the states and it has won some awards as the best retsina. Domaine Papagiannakos Retsina is made with Savatiano grapes from Attika. �Modern retsinas are very well vinified wines, and the resin is added to supply the wine with the aromas of the pine forest, not to cover bad wines. 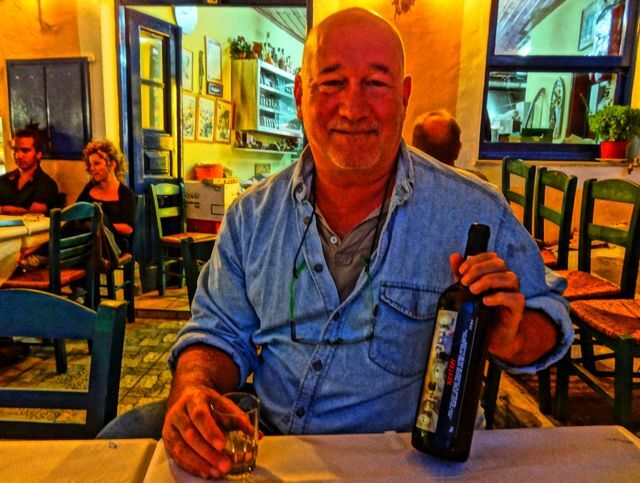 Chill it well and sip it with meze like dolmades, spanakopita, tzatziki and calamari,� says Owner/Winemaker Vassilis Papagiannakos. Gaia�s Ritinitis Nobilis is made from Roditis grapes and a small amount of pine resin and has a faint smell of eucalyptus. I used to think that because my grandparents came from Lakonia in the Peloponnesos that maybe my love of the local Kidonitsa was more about pride of origin than the fact that it is a really good wine. But now I am not so sure after buying a case from Greece and Grapes last summer and comparing it to just about every other white wine in Greece. Then when Nicholas, the owner of Kylix Restaurant in Kea, known for its selection of Greek wines, began carrying Monemvasia Winery's Kidonitsa I thought that maybe I was onto something and that I, unsophisticated wine drinker that I am, had actually discovered a great wine that had flown under the radar of just about everyone. 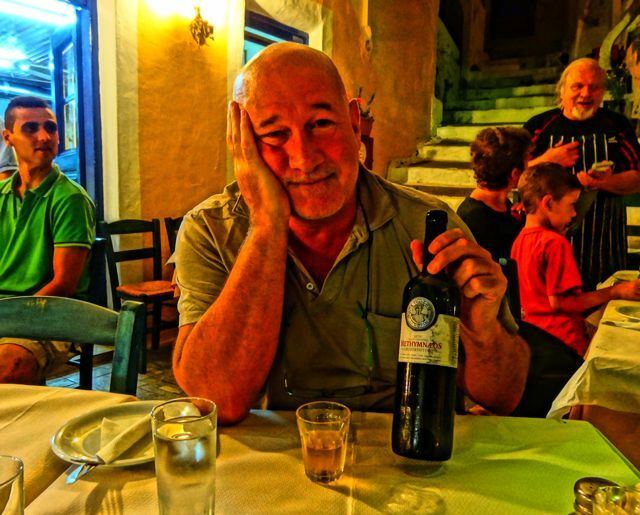 Well now the word is out and people are discovering that this indigenous grape from the south-east Peloponnesos is not just the poor man's version of Asyrtiko. It is better than most Asyrtikos, particularly those that you will find in your local wine store for under $20. Greece and Grapes carries 3 different Kydonitsa with the best being the one from Monemvasia Winery, and the others from Theodorakis Estate and Giannopoulos, (though you may not find them all unless you search for 'Kydonitsa' and 'Kidonitsa'). Recently I took great pride in going to my local wine store where the guys who work there know EVERYTHING about wine, and they had never heard of Kydonitsa. How did I describe it? "Like Asyrtiko but better" of course. What do you expect? I'm from Lakonia. The island of Lesvos was renown in antiquity for it's wine. It is claimed the island had the finest soil and climate for growing grapes and the wine from Lesvos was the most treasured in the wine cellars of the Byzantine Emperor. Unfortunately a blight killed all the grapes on the island and wine-making on Lesvos died out, one reason why ouzo is now the drink of choice there. But in the remote agricultural village of Xidera something very special has happened. Dimitri Lamprou has been paying farmers in the area to grow grapes again using a disease resistant strain and organic methods. He has built a state-of-the-art winery in this village and has begun production of what I think is one of the best wines I have ever tasted. Of course I don't have the expertise of Mr Manessis, but I know what I like and I think if you try this wine you won't be disappointed. 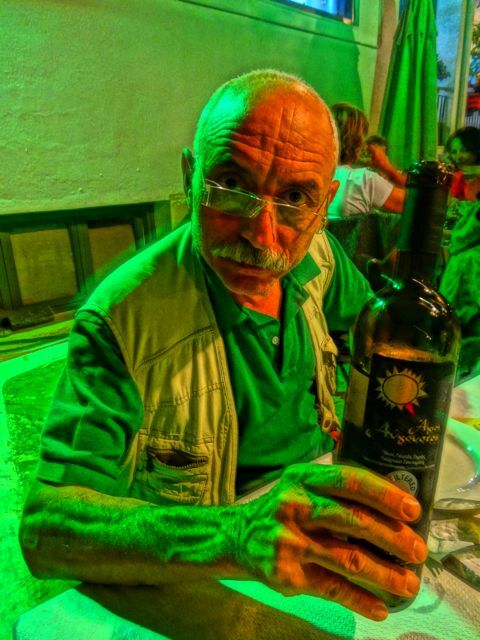 The wine is called Methymneos and was available in Lesvos and by the time you read this may be available elsewhere in Greece and wherever you live too. In Athens you can find it at the Lesvos shop at 29 Athinas Street next to the Hotel Attalos and at many of the small wine bars that have sprung up downtown. You can order this from Greece and Grapes. When we went to Santorini several years ago we went with a friend to Artspace, a small winery in Exogonia owned by Antonis Argyros that was also an art gallery, who only produced about a thousand bottles a year mostly from the local Assyrtiko grapes. 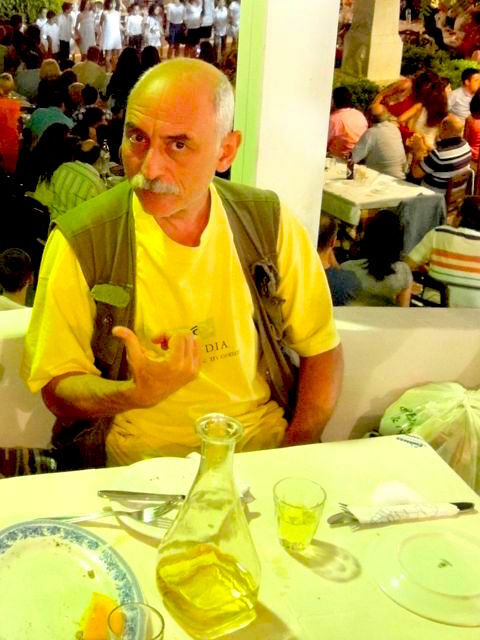 We returned in 2012 to find that he had expanded to about ten thousand bottles and had added a few new wines and even raki, which for those who don't know is like ouzo without anise. The building, which contains caves dug into the soft stone of Santorini, was formerly a tomato paste processing plant, owned by his father and a winery back in 1861. Antonis has turned it into a museum with traditional wine-making equipment much of which he actually uses, and new modern equipment and he produces perhaps the best wine we had on the island. His grapes are organic too. If you can only visit one winery then I would suggest this one. Make sure to get a bottle of his Saint August and his Saint August Reserve which have become our staples after leaving the island with a suitcase full of them. These grapes are harvested in August, thus the name. Also his Nichteri is a wonderful dry red, maybe the best I have ever tasted. Unfortunately since I can't get Artspace wine in America I am forced to turn to other Assyrtiko producers. Luckily, since nobody in Greece can afford good bottled wine, a lot of it is being sent to the USA. There are a number of Assyrtiko wines by Estate Argyros ranging in price from about $10 for their Atlantis to $100. If you can't find anything by Argyros then look for Costa Lazaridis, Gaia Estate, Sigalas or Hadzidakis. Or just look for the word Assyrtiko on the front and an address in Santorini on the label somewhere. Malvassia is not a very well known wine at the moment, except to people who know wines well but it is currently my favorite after spending a week in my grandmother's village and the rest of the summer trying to find it in the supermarkets and cavas of Athens and Kea. It originates from the area of Monemvasia in Lakonia, a region of the Peloponessos, mostly from the Monemvasia Winery in the village of Vilies who put out all the wines in the above photo. Malvasia is the Venetian name for the fortress town of Monemvasia and the wine has been produced since the 13th Century, if not earlier. Most of the production moved to Crete in the 15th century and the purist form of the original Malvasia grapes are found in Paros and other Cyclades islands. The wine grown in Monemvasia now and sold under a number of different labels is a mix of various grapes, including Kidonitsa, a rediscovered variety that makes a delicious dry white that is on its way to becoming popular and can be found in shops in Lakonia for about 7 euros. If you like dry wines look for the Fileri Rose, Maleatis red and white, the Monemvasios Red Cava and White Dry and the organic Laloudi. For those outside of Greece, Monemvasia Winery makes an Akra Morea red and white of which I found the red to be OK but the white was so delicious that I bought another bottle just to make sure that I was not mistaken since the price was so cheap. 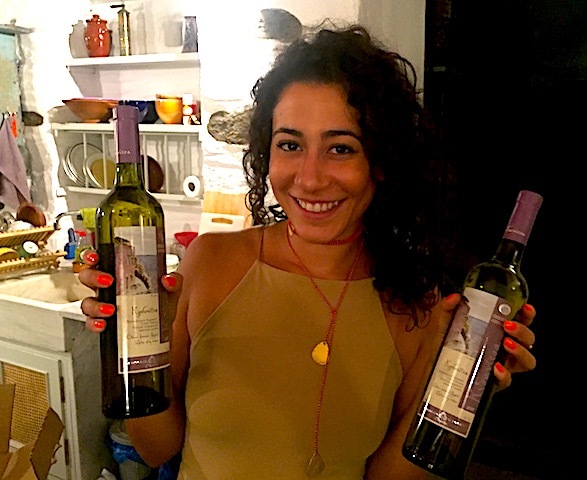 Recently a small import company called Flying Olive Farms has been representing the Monemvasia Winery and introducing Americans to over a dozen of these very good wines, including the above mentioned Kidonitsa. (However their webmaster seems to have taken a leave of absence and their web site is pretty much unusable). You can also find a number of wines from the Monemvasia area on Greece and Grapes Monemvasia page and they ship just about anywhere. There are a number of other wines from the Peloponessos, some of them by small wineries, sold in shops and roadside stands in plastic bottles, that are better than what your local wine merchant might recommend in the twenty dollar and up range. If you are driving around Nafplion and the Argolis, Nemea or one of the other wine producing areas you will probably see one of these stands and you can stock up. They are not all first class wines but some small producers are rightfully proud of the wine they make even if it does not come in glass bottles with fancy labels. And since they cost about 4 euros a liter, if you don't like it, feed it to the cat and get something else. For those of you who are far from Greece or anywhere that sells Greek wines you can find Nemean wines on Greece and Grapes Nemea Page. Assyrtiko is the indigenous Santorini grape that is used in some of the most popular white wines of Greece and is now grown all over the country. It is almost effervescent and has a crisp mineral taste because of the rich volcanic soil of Santorini and the fact that the island gets almost no rain. 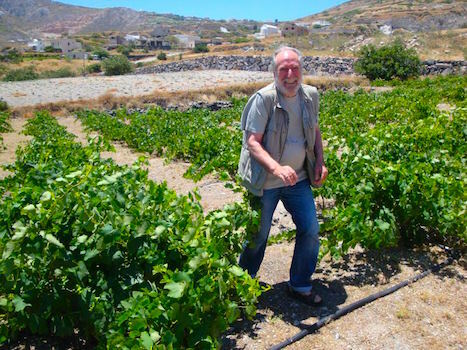 The best bets for Assyrtikos come from Santorini and include Argyros Estates, Boutari, Moraitis, and my favorite from Artspace Winery (photo). Also the Domaine Costa Lazaridi 2013 Ch�teau Julia Assyrtiko which comes from Drama, in Northern Greece and the 2007 Domaine Sigalas Assyrtiko/Athiri which is a blend. These are all available in the USA with the exception of Artspace which you have to go to Santorini to get. But you were probably going there anyway. Read more about Santorini wine from my Santorini Guide. Also see Greece and Grapes Assyrtiko Page if you want to buy and have it shipped right to your door. Agiorghitiko comes mostly from the region of Nemea but is also grown in Attika and Macedonia.and is the most widely planted grape in Greece. The wine can be a dark and fruity red similar to a Merlot, or it can be light and rose like. Called the Wine of Saint George, it is also known as the Blood of Hercules based on the legend of the Greek hero slaying the Nemean lion. The best are the Tselepos 2011 Driopi Classic Agiorgitiko from Nemea, the Gaia Wines 2008 Gaia Estate Agiorgitiko, also from Nemea or the more economical Voyatzis 2011 Kyklos Agiorgitiko from the Peloponessos. If you can find it get the Megapanos Nemea aged in oak barrels for a year, though you may have to go to Greece to get it. Monemvasia Winery exports an Agioritiko to the USA. You can read about the Wine Roads of Nemea on my Nemea Page. Also see Greece and Grapes Agiorghitiko Page if you want to buy a bottle or two. Limnio is the wine from the island of Limnos which like Santorini is also volcanic and makes excellent wines usually either a dry white or a sweet red using the Muscat of Alexandria grape variety. Homer praises the quality of the island's wines in the Iliad. Though the highest rated wine from Limnos according to American wine experts is their sweet desert wine I prefer their dry whites, in particular from the Xatzigeorgiou Winery whose Ambelourgos has won the gold and silver medals several times at the Thessaloniki International Wine Competition as has their sweet Muscat of Limnos. Their Μοscato d� Ifestia is a semi-sparkling white wine and their Lagopati is another highly rated dry white. 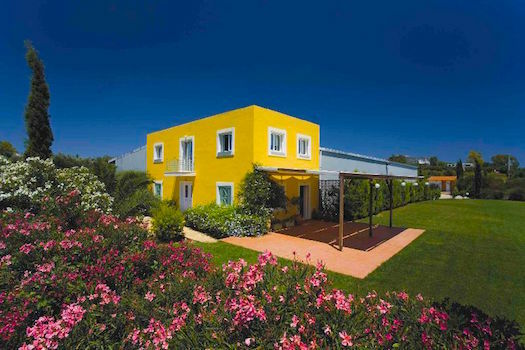 Other wineries on the island include the Association of Agricultural Cooperatives of Lemnos (photo), Kremydas Winery, P. Chonas - P. Vastardos Winery, and the Limnos Organic Wines made by Yiannis Savoglou and Pandelis Tsivolas. I expect that in the next few years people will be talking about and drinking Limnos wines. Visit Greece and Grapes Limnos Page if you want to buy. Moschofilero is the grape from Mantinea in the Peloponessos and is made into a crisp white wine. The best wines include the Spiropoulos 2013 Organic Moschofilero as well as the Boutari, Semeli, Skouras, Antonopoulos and Voyatzis, all well known winemakers from Mantinea or other areas of the Peloponessos. Skouras Zoi is a rose made from Moschofilero and Roditis that is widely available in the USA as is the Skouras Moschofilero which is also very good. We drink Moschofilero a lot. The white Akra Morea by Monemvasia Winery is a good one that is available in our area. Visit Greece and Grapes Moschofilero Page if you want to buy. Roditis comes from Attica, Macedonia, Thessaly and Peloponnese and the best thing about it besides the taste is that it is usually cheap. Tetramythos 2009 and 2010, from Patras is considered one of the best wines you can buy under $20 by the Wine Enthusiast. Other good wines using these grapes include Mercouri Estates, Kouros, Pavlidis, Lafazanis and Oenoforos, all from the Peloponessos. Visit Greece and Grapes Roditis Page if you want to buy some. Savatiano is the grape grown most around Athens in the region of Attica and the product is generally well balanced white wines and of course the mother of all Greek wines: Retsina. Among the best is Papagiannakos 2003 Savatiano, and though I have never seen it in Greece, My Big Fat Greek Wine 2009 Private Label White Savatiano which is probably called something different in Greece. But if you can find it buy the Megapanos White Savatiano from Mesoghia which may or may not be available outside of Greece. Visit Greece and Grapes Savatiano Page if you want to buy some. Malagousia is an ancient grape that was brought back from extinction that originated in the region of Nafpaktos above the Corinthian Gulf and is now grown in Macedonia, the Peloponessos and in Attika and made into a fruity, crisp white wine. Try Domaine Gerovassiliou which has a sort of grapefruity taste to it similar to Vino Verde as does the Porto Carras 2003 Regional Wine of Sithonia Malagousia which comes from Halkidiki in Northern Greece. Thymiopoulos Boarding Pass Malagousia is available in the USA and I think it is very good. Visit Greece and Grapes Malagousia Page if you want to buy some. Athiri is an ancient grape from Santorini that is often combined with Assyrtiko, also from Santorini, and Aidani, which is from the Cyclades. In fact it is rarely if ever used by itself but it is so easy to grow and yields high quality grapes that are soft enough in flavor to enhance, or at least not hurt, the flavor of whatever grape it is mixed, for instance in the highly rated Domaine Sigalas Santorini Assyrtiko-Athiri 2011. Visit Greece and Grapes Athiri Page if you want to buy some. Xinomavro is a dark wine from Macedonia and is grown mostly in the wine region of Naoussa and is sometimes combined with Merlot, Syrah or other grape variaties though by law or decree or holy edict, the wines of Naoussa are all 100% Xinomavro. Popular and recommended wines are the Thymiopoulos 2012 Young Vines Xinomavro, Kir-Yianni 2010 Ramnista Xinomavro, Cavino 2011, Chrisohoou 2010, Vaeni 2006 Grande R�serve, Boutari 2008 Dry Red Xinomavro, Domaine Kardas 2001 and the Tsantali 2006 Reserve Xinomavro. Visit Greece and Grapes Xinomavro Page if you want to buy some. Robola is from the island of Kefalonia made mostly by three companies: Domaine Foibos, Gentilini, and the Robola Cooperative of Kefalonia. 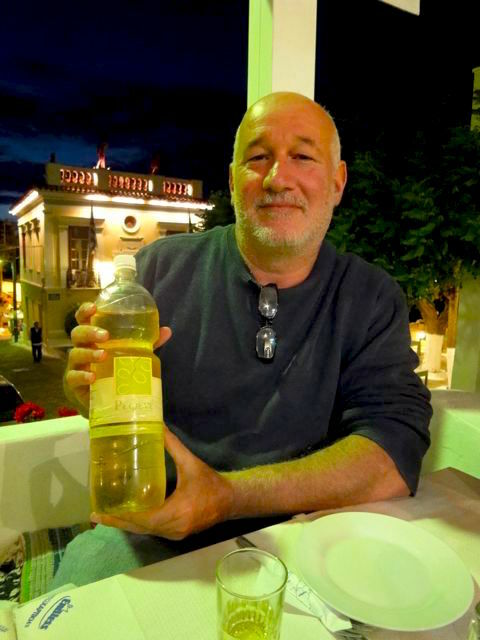 It is a fruity, minerally white wine that tastes best in a seaside taverna in Kefalonia. Visit Greece and Grapes Robola Page if you want to buy some. 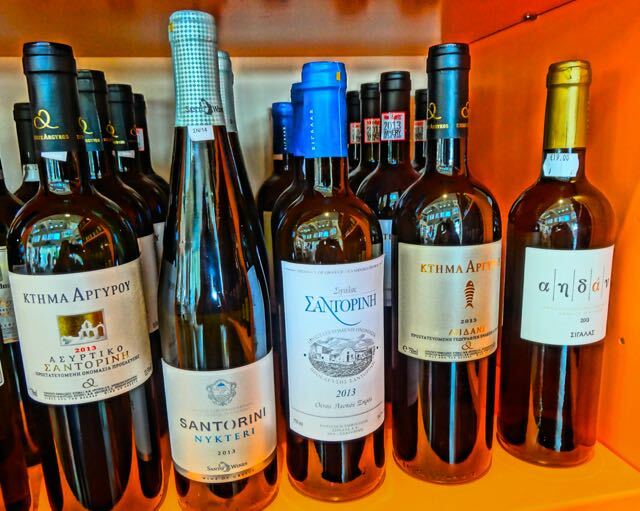 Chances are that your local cool wine store, gourmet foods shop or even your Whole Foods or other contemporary supermarket will have one or two of these Greek wines listed above. If they don't you should go every day and ask someone who works there to carry it. If you speak to a different person each day they will think a lot of people want it. If their distributor does not carry Greek wine for some odd reason then you can google Greek Wine Wholesalers and find the one in your area and give the information to the store. In my area there are a couple Greek wine distributors. The previously mentioned Flying Olive Farms which carries the Monemvasia Winery line from the Peloponessos, which have enough variety that you may not need to look any further. CHL Trading out of Charlotte, NC, distributes well known Greek wine to restaurants and shops in North and South Carolina. Total Wine has a number of popular Greek imports on their website but you have to use their search option since they don't list Greece with all the other wine producing countries, so they don't even get a link from me. But if you are a single or family of wine lovers who wants to buy a few bottles or a few cases then visit Greece and Grapes for what has to be the best selection of wines, ouzo and Greek beers anywhere. In the neighborhood of Psiri in Athens, on Agios Thelkas Street just off Ermou by the Monastiraki train station is the tiny workshop of Greece's great poet Stavros Melissinos. Workshop of a poet? Well, yes. 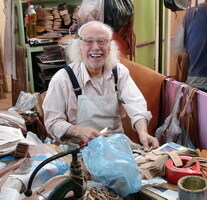 You see Melissinos profession is as a sandal-maker, and in fact he is the most famous sandal-maker in Athens, which is a lot easier to make a living at than writing poetry. His greatest work is his Rubaiyat which is a series of poems that I would describe as a spiritual exploration of the pain and sufferings of mortal life and on the joys of drinking wine, the cure to the pain and suffering. Here are a few of my favorite verses from the Rubaiyat of Melissinos. There are 127 verses in all and it has been translated from the original Greek into English, French, German, Italian and Spanish. If they say I found another friend besides the jug ever!